Women are hard to shop for. Heck, it’s hard to shop for myself sometimes, so I end up buy everything and give it a few days before I figure out what I’m keeping. Terrible habit I don’t recommend by the way- sometimes you forget about those items and then are left holding on to something you’ll never wear. Anyhow, I’ve gathered up a variety of items at several price points to help narrow down your search for holiday gifts – feel free to send directly to your man and family so they know exactly what to get you! Hope you get everything on your wish list! Gemstone iPhone Case by Recover, $20: Comes in regular and plus sizes for iPhone 6/7/8. It also comes in a variety of patterns and colors. Gloss Bomb Lip Luminizer, $18 & Stunna Lip Paint, $24: Both beauty products are made by Fenty Beauty and are compatible with any skin tones so you don’t have to worry whether or not it will look good on her. H&M Earmuffs, $9.99: Cute winter accessories that also keep you warm are the best! These earmuffs also come in a beautiful blue. Tango Ball Drop Earrings, $38: Keep it safe with black, get bold with the plum or totally push her creative limits with the multi colored pattern pair but either way, these statements earrings can be styled so well for every day or evening wear! Get 30% off until 12/15 with code GIFT30. Scented Candles, $18 (small) & $30 (large): No girl can ever have too many candles. Especially when they come in adorable vessels like these! The two scents are also Anthropologie staples. Stemless Flutes, $50: These stemless flutes from Kate Spade are so cute and the perfect addition to her bar cart. Bronzer and Highlight Palette, $24.95: Have you been on Instagram lately? Then you know how girls are swooning over highlights that blind the world! This 2-in-1 Bronze and Glo palette from Crown Brush works well on all skin tones and will surely be a great addition to her makeup collection with its multi-use versatility. Knit Scarf, $44: Oversized and extra-long scarves are so perfect to bundle up with in the cold or let hang for a stylish relaxed look as the weather chills. French Marble Wine Cooler, $24.95: Crate & Barrel has the trendiest items for the home and this marble wine cooler would definitely adds flair to any home. It can also be used for flora on the living room table or as a decorative piece on the shelf when not in use. High-Waist Moto Leggings, $114: These high waist leggings will keep her sweat free and comfortable during her workout and keep her stylish for brunch with the girls. Plus they’re engineered to lift, sculpt, contour and smooth aka the perfect leggings. Jo Malone London Set, $85: If she’s looking for an everyday fresh scent this is it. You can pick from this trio set which includes the cologne, hand wash and body crème or choose from the variety of cologne sizes available and throw in a candle. Modern Champagne Flutes, $79 for 2: These are probably the coolest flutes I’ve ever seen! They are hand-blown, super modern and unique – perfect for a fabulous hostess. White Stone Diffuser, $119: All things functional should also look nice in your home. Makes for less items in storage and this diffuser definitely fulfills both purposes. And it diffuses essential oils so whatever room it’s in will smell amazing! Here’s another (cheaper) option from Urban Outfitters for $59! Scuffette II Slipper by Ugg, $98.95: Comfy suede slippers with an interior made of wool – best house shoes ever! Silk Pillowcase, $79 for a standard/queen: Sleeping pretty is not just a saying, it holds true with some serious benefits. Silk pillow cases reduce split ends while protecting and maintaining hydration to the face. She will be so thankful for your thoughtful gift.. might not be a bad idea to grab yourself one too. Also sold at Net-a-porter and Nordstrom. Mesh Strap Olivia Burton Watch, $145: A classic watch that isn’t over bearing on the wrist is a wardrobe staple. I personally have this watch and love it – I actually wear it every day whether I’m dressed casually or dressed up. If she already has a classic watch, grab one that has a patterned face, different shape or overall different color! ASOS Patched Faux Fur Mongolian Coat, $151: This coat is adorable! Beautiful neutral shades with functional pockets (because yes, pockets are important to any woman) is a major win for her and definitely a win for you. *Order from ASOS before 12/18 for free standard shipping. Hiline Over the Knee Boot by Stuart Weitzman, $798: I’m sure any girl would be happy to accept an . WhileI love these beautiful blue, it comes in seven other colors. Gucci Leather Belt, $450: It’s the upgraded version of the classic black leather belt. These typically sell out quickly at department stores since they have limited quantities so I’ve linked a couple of other options as well at Saks 5th Ave and Gucci’s online store. Bloomingdales and Nordstrom only carry select Gucci products so you’ll need to call ahead to confirm. Burberry Reversible Tote, originally $995, now on sale for $795: A sturdy classic tote that can hold a laptop and then some is vital. I don’t focus on designer labels, but when it comes to bags, I think quality is super important and Burberry certainly provides a quality product that supersedes all trends. Jimmy Choo Glitter Pumps, originally $625, now on sale for $419 at Neiman Marcus. You can’t go wrong with any designer leather shoes and this glitter pump adds some fun to the classic pump. These are perfect for the holidays, special events or to simply spice up a casual look. They are also available at Nordstrom. David Yurman Crossover Ring, $650- 700: Now, I’m not a big fan of getting a gal a ring if you haven’t already given her that one ring that matters to all women, so stay away if you’re not engaged or married already. LOL! This collection is stunning, timeless and I just can’t get over the mixed textures. Gold Beats by Dre, $299.95: Anything gold is perfect, duh! These headphones are wireless, provide great sound quality and look good. 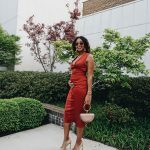 Chloe Carlia Sunglasses, $375: These retro glam two-toned round shades will have her feeling like a celebrity no matter where she goes or how she’s dressed. Don’t be selfish! Be sure to take a look at Gifts for Him so he can have just as special of a Christmas! Thank you! Hopefully they follow the guide so you’re all smiles on Christmas morning! 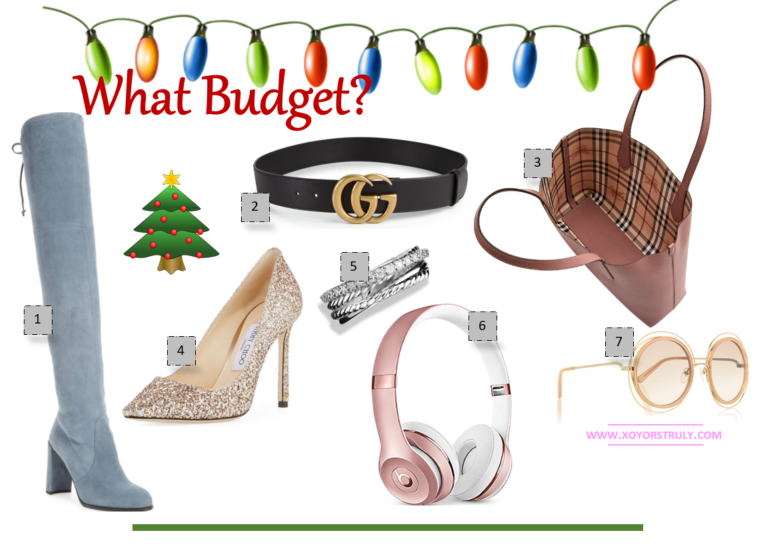 Nice gift ideas for every budget. I most definitely asked for over the knee boots this year. Thank you! I did as well 🙂 Great minds think alike! I will never get tired of scented candles, and these look heavenly! I know, right!? I have so many candles and still shop for more. You’re welcome, Erin! Glad you like the phone case- I’m obsessed with their entire collection at Nordstrom! Love how you called the last group “What budget?” Made me lol! Love all your picks, babe!